Preston proudly lays claim to having created the first municipal park in 1833 when it enclosed the final piece of Preston Moor to the north of the town and named it Moor Park. The claim was recognised in the park’s listing as Grade II* in 1994,  but the claim did not go unchallenged. 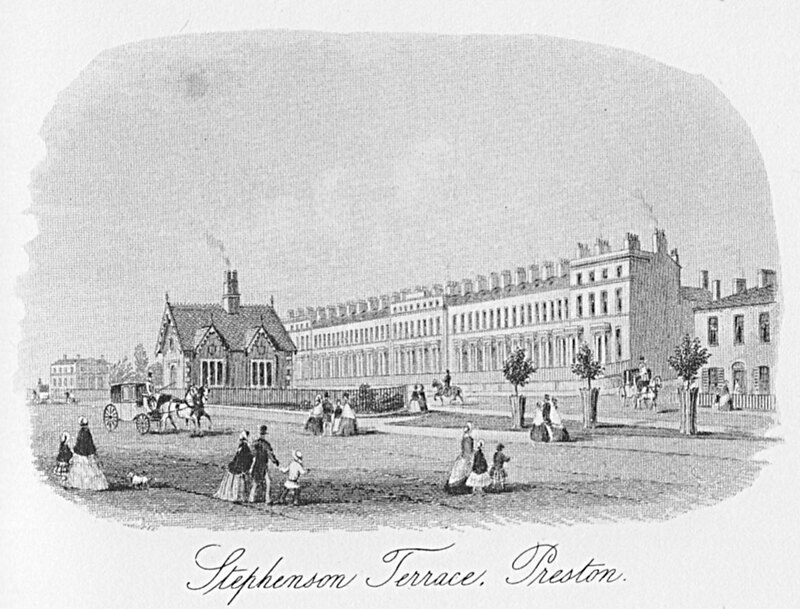 Prof Richard Hoyle in a valedictory article in which he said farewell to the town where he had lived and worked for nearly two decades argued at length that the actual date of the park’s creation was 1867, long after other municipalities had opened their parks. Planting: Moor Park retains much of its C19 planting. The ‘Plan of improvements on Preston Moor’, published in the Preston Chronicle (1833), shows the boundaries and basic design of the site remain unchanged. The moor was drained at great expense to provide an open central area labelled ‘Green Pasture’ (let as grazing until 1865), lightly planted with trees and surrounded by a perimeter walk, serpentine along the northern boundary. A lake was formed towards the north-west corner of the site and Ladies’ Walk (Moor Park Avenue) was laid out along the southern boundary. The figure of £10,826 7s 9d seems to have been taken from Hewitson. But he treats the sum as the amount spent on the creation rather than the improvement of the park, noting that, ‘The forming of Moor Park cost £10,826 7s 9d.’ And earlier he writes, ‘… the park has, since its opening, in 1867, been in various respects attractive and enjoyable.’  This raises the question of when Moor Park came into being: in 1833 or 1867. 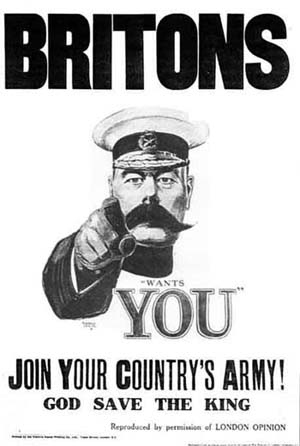 And, if the latter, does Preston have to surrender its claim to park primacy? The question is answered firmly in favour of surrender in the article on Moor Park by Prof Richard Hoyle. The article was described by Prof Hoyle as his ‘valediction to Preston, and to Lower Bank Road in particular’, where he lived for nearly 20 years, and from where he had a clear view from his office over Moor Park. In the article he challenges the claim that Moor Park was the world’s first municipal park. He argues that the town had to wait until 1863 for plans to be drawn up to turn the enclosed moor into a proper municipal park: the Moor Park which was opened in October 1867, along with Avenham Park. Preston Council could, of course, contend that Prof Hoyle was making the issue far more complicated than it need be. The corporation in 1833 owned the land, so it was municipal, and they were landscaping it to make it a pleasant place of recreation for the town, so it was a park: therefore, it was a municipal park, on the basis that if it quacks then it’s a duck. Assigning such benign intentions to early Victorian public bodies have, of course, to be treated sceptically. A more likely motivation for Preston’s worthy councillors was to turn a large area of scrubland to profit, and, by improving the landscape, encourage the development of a middle-class housing around the periphery. Moor Park can then, perhaps, be seen as a product of the council’s greed rather than any beneficence. Prof Hoyle maintains that the enclosed common had to wait until 1867 to become a municipal park, along with Avenham Park. 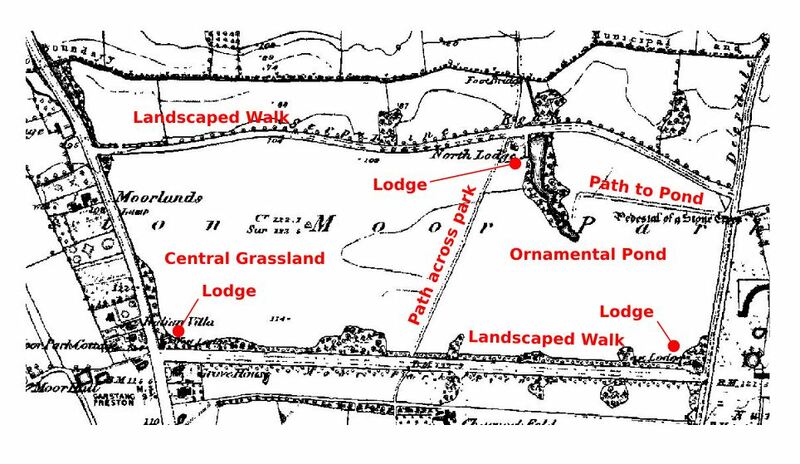 And yet comparing Moor Park in the 1840s with Avenham Park in the 1890s, as shown on the relevant OS maps, they seem remarkably similar in their layouts. They both had pleasant walks, attractive lodges, an ornamental pond and a large area of open grassland in the centre with a single path across it. Of course, Avenham Park did not have Moor Park’s grazing cattle (the northern equivalent of Richmond Park’s deer herd?). 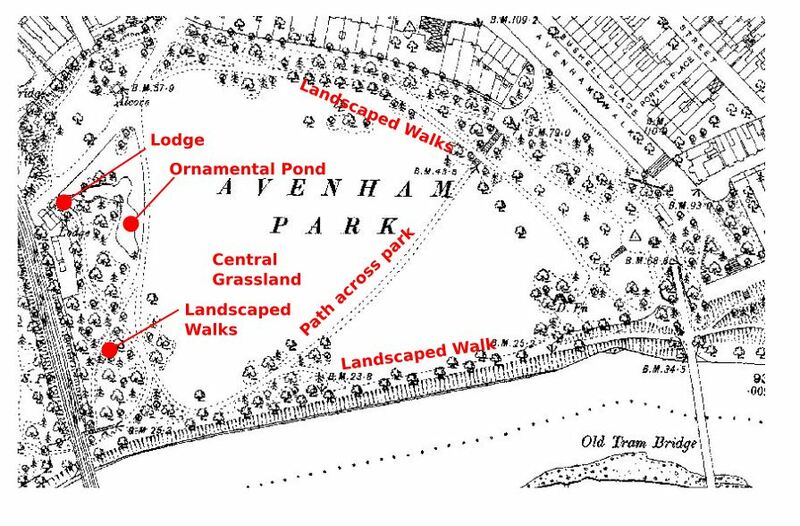 So what did Avenham Park in the 1890s have that Moor Park in the 1840s did not that made the former a municipal park and the latter merely an enclosed common? The surveyors of the 1840s clearly saw it as a park, labelling it Preston Moor Park on their map. The map at the top is that of Moor Park surveyed for the Ordnance Survey in the 1840s, the one below is taken from the OS map showing Avenham Park in the 1890s. If the two were unnamed and undated, could Professor Hoyle say which was park and which merely landscaped walks? Prof Hoyle’s valedictory article provides a detailed account of the influence of local politics on the development of parks and public spaces in Preston, drawing on a wealth of source material in newspapers and council reports, but in the end he does not manage to undermine Preston Council, Historic England and Helen Conway in their advocacy of the primary position of Moor Park in the history of municipal parks. The 1833 enclosure to form Moor Park may not have been marked with the civic ceremony that marked the completion of Milner’s improvements in 1867: but in 1833 Preston clearly created a park. * Somewhat disappointingly, Prof Hoyle’s article in Northern History is not available online to non-academics since it is enclosed behind a rather expensive pay wall which even JSTOR does not breach. The journal can be found at Lancashire Archives and in the University of Central Lancashire library (open to local residents). ‘History of Moor Park | Preston City Council’, accessed 29 November 2017, http://www.preston.gov.uk/yourservices/culture-parks-and-events/moor-park/history-moor-park/. ‘Moor Park’, Historic England, n.d., https://historicengland.org.uk/listing/the-list/list-entry/1001309. R W Hoyle, ‘The Enclosure of Preston Moor and the Creation of Moor Park in Preston’, Northern History 49, no. 2 (September 2012): 281–302. Charles Hardwick, History of the Borough of Preston and Its Environs, in the County of Lancashire (Preston: Worthing, 1857), 436. Anthony Hewitson, History of Preston, reprint of 1883 edition (Wakefield: S. R. Publishers, 1969), 328–29. Helen Conway, People’s Parks : The Development and Design of Victorian Parks (Cambridge: Cambridge University Press, 1991). Hardwick, History of Preston, 309. Lyon Playfair, Report on the State of Large Towns in Lancashire (W. Clowes & Sons, 1845), 53, https://books.google.co.uk/books?id=drko578wsAoC&pg=PA1&lpg=PA1&dq=Report+on+the+state+of+large+towns+in+lancashire&source=bl&ots=n1C4NTgrCY&sig=ACfU3U1eECF-Ov-qSegs2AEJQNEXYQvY2w&hl=en&sa=X&ved=2ahUKEwjbyva4ovLgAhUnRhUIHWExAMsQ6AEwCXoECGIQAQ#v=onepage&q=clay&f=false.